Baton Rouge is the capital of the U.S. state of Louisiana. Located in East Baton Rouge Parish, the city is the second-largest in the state behind New Orleans, and has a population of 229,553 people as of the 2010 census. The metropolitan area surrounding the city, known as Greater Baton Rouge, has a population of 802,484 people as of 2010. The Baton Rouge area, also known as the “Capital Area”, is located in the southeast portion of the state along the Mississippi River. The area owes its historical importance to its site upon Istrouma Bluff, the first bluff upriver from the Mississippi River Delta, which protects the city’s residents from flooding, hurricanes, and other natural disasters. In addition to this natural barrier, the city has built a levee system stretching from the bluff southward to protect the riverfront and low-lying agricultural areas. From evidence found along the Mississippi, Comite, and Amite rivers, and in three Native American mounds remaining in the city, archaeologists have been able to date indigenous habitation of the Baton Rouge area to 8000 BC.The mounds were built by hunter-gatherer societies in the Middle Archaic period, perhaps as early as 4500 BC, more than a thousand years before the pyramids of Egypt were begun. In the 2000s (decade), Baton Rouge has proven to be one of the fastest-growing cities in the South in terms of technology. Baton Rouge’s population temporarily exploded after Hurricane Katrina, as it accepted as many as 200,000 displaced residents. Metropolitan Baton Rouge is one of the fastest growing metropolitan areas in the U.S. (under 1 million), with 602,894 in 2000 and 802,484 people as of the 2010 census.Some estimates indicate that the Baton Rouge metro area could reach 900,000 residents as soon as 2013. The city has a vibrant mix of the cultures found throughout Louisiana, from which it developed its motto: “Authentic Louisiana at every turn”. Baton Rouge enjoys a strong economy that has helped the city be ranked as one of the “Top 10 Places for Young Adults” in 2010 by Portfolio Magazine and one of the top 20 cities in North America for economic strength by Brookings.In 2009, the city was ranked as the 9th best place in the country to start a new business by CNN.The city is home to one Fortune 500 company and one Fortune 1000 company, including Shaw Group.Lamar Advertising Company has its headquarters in Baton Rouge. There are many architectural points of interest in Baton Rouge, ranging from antebellum to modern. 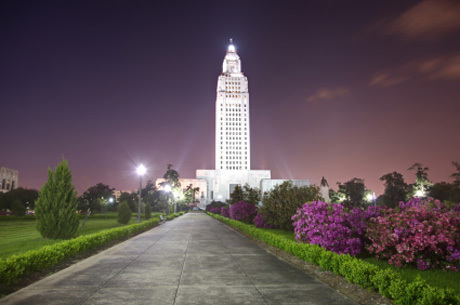 The neo-gothic Old Louisiana State Capitol was built in the 1890s as the first state house in Baton Rouge and was later replaced by the 450 feet (137 m) tall, art-deco New Louisiana State Capitol which was the tallest building in the South when it was completed. Several plantation homes in the area such as Magnolia Mound Plantation House, Myrtles Plantation, and Nottoway Plantation showcase antebellum-era architecture. Louisiana State University has over 250 buildings in Italian Renaissance style, one of the nation’s largest college stadiums, and is endowed with many live oaks. Several examples of modern and contemporary buildings are downtown, including the Louisiana State Museum.A number of structures, including the Baton Rouge River Center, Louisiana State Library, LSU Student Union, Louisiana Naval Museum, Bluebonnet Swamp Interpretive Center, Louisiana Arts and Sciences Center, Louisiana State Archive and Research Library, and the Pennington Biomedical Research Center, were designed by local architect John Desmond. Yazoo and Mississippi Valley Railroad Company Depot, currently houses the Louisiana Art and Science Museum. All information about Baton Rouge courtesy of Wikipedia.